Black Box, a leading digital solutions provider dedicated to designing, implementing and maintaining today’s complex communications infrastructures, has just appointed Novo as a distribution partner to deliver its complete range of KVM, audio/video, IT infrastructure, networking and datacom products and solutions. This new partnership will help boost Black Box’s presence and further penetrate the Middle East market by bringing the combined skill set and technical know-how of both Black Box and Novo to the region. “We are very pleased and excited to partner with Black Box. 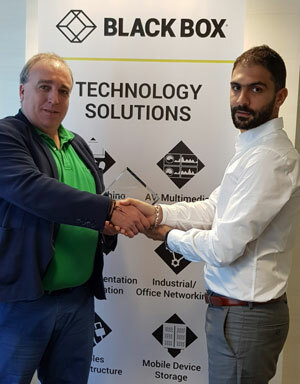 Combining Black Box’s portfolio, 40+ years of experience, and expertise with our profound understanding and knowledge of the market allows us to provide comprehensive IT network connectivity solutions tailored to customer’s needs and requirements,” said Wael Haidar, Managing Director for Novo.